By 2021, adjunct faculty teaching three-credit courses at Barnard will be paid $10,000 per course. The Barnard Contingent Faculty Union (BCF)-UAW Local 2110 was formed in 2015. In the space of 24 months and a single contract, that UAW affiliate has managed to boost the pay of most of its adjunct faculty members by 50 percent. No part-time faculty or unified local affiliate of the AFT, NEA or AAUP has achieved any such pay bump for the 120,000+ adjuncts which have been represented by those three unions over the past thirty years. In fact, adjunct faculty per course pay nationwide averages $2,500, even as the AFT boasts it has added tens of thousand of new adjunct faculty members. 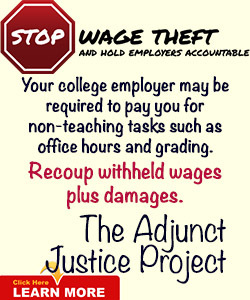 The reason adjunct pay has stagnated—even for adjuncts represented by higher ed. faculty unions—is simple, according to Washington State long-time adjunct activist and author Keith Hoeller: the nation’s higher education unions have for decades represented their full-time and part-time members unequally and treated them as “second-class citizens,” according to Hoeller. 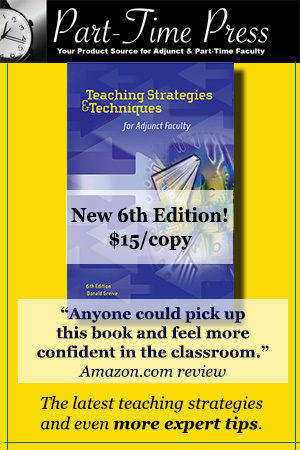 To be sure, when the AFT launched its Faculty and College Excellence (FACE) legislative plan, I was appalled. The union lobbied legislators in New York, New Mexico, Oregon, California and Washington for more money to create more full-time faculty jobs. Ostensibly, adjunct faculty at the colleges where the new full-time jobs were created would be given a shot at the jobs. In reality, that didn’t happen. At one Washington community college the only adjunct who got one of the new full-time jobs created was the guy who testified in favor of FACE before the state legislature. He went on to be president of the faculty union and then to embezzle union funds—a crime state and local union officials attempted to hide. Shortly after the FACE program was launched (2011) came the non-profit New Faculty Majority membership organization and foundation. Sigh. That adjunct advocacy group was soon controlled by higher education union representatives. The 2014 990 federal tax return filed by the NFM Foundation shows shrinking revenues. The non-profit took in $80,213 and paid its president $75,287. The total losses for NFM that year were $109,102. The New Faculty Majority membership organization tax return shows no income. The NFM’s president has done loads of mewling and puking to the higher education and mainstream media about the horrendous injustice suffered by adjuncts—all without ever mentioning the part higher education unions have played in perpetrating and perpetuating those same injustices over the past three decades. I have watched with increasing trepidation as national adjunct activists and the higher education union leaders embraced a movement dubbed the $5K Manifesto. Adjunct faculty, those who spoke in favor of the Manifesto argued, should be paid a minimum of $5,000 per course. Well, of course they should. Anyone who tells you that adjunct faculty shouldn’t be paid $5,000 per course is just yanking your chain. The full-timers who believe adjunct faculty don’t deserve $5,000 per course are the fading Norma Desmond’s of Academe, always ready for their close-ups and clinging desperately to their privilege. I never supported the $5K Manifesto. I thought the whole idea did a terrible disservice to adjuncts. You see, even at $5,000 per course, teaching four courses per year (a full-time load) is still a poverty wage for a family of three. For an individual to be eligible for Medicaid and foodstamps in 2016, s/he would have to have earned less than $16,400 per year. To me, the $5K Manifesto was a bone and adjuncts were the dogs. Dogs love bones and can contently chew on them for hours, days, weeks, months, years—while everyone else gorges on the meat. For the past decade, AdjunctNation has called for pay equity for adjunct faculty. Period. Equal pay for equal work. In most cases, $5,000 per course is not equal pay for equal work. We have repeatedly editorially flayed the skin off of higher education union officials who have negotiated so-called “equal percentage raises” for full-time and part-time members of unified union locals. We have chided, mocked and derided those high education union officials who have negotiated contracts that capped the pay and work made available to their own adjunct faculty members. When Washington State and California legislators set aside tens of millions of dollars for adjunct faculty equity pay, we reported on the faculty union officials who set up scams in order to siphon away equity pay and give it to full-time faculty instead (mainly by having full-time members classified as adjuncts when they taught overload courses). Compare this to the AFT’s organizing record prior its 2006 launch of a state-by-state legislative push to increase the number of full-time faculty. Of the 44 faculty units organized by the AFT between 2001-2006, 12 were for full-time professors, 10 were a mix of full- and part-time professors, and 22 were for professors with part-time positions. In addition, in 2006 as a part of the push for more full-time faculty, the three higher education unions embraced the goal of “pay parity” for adjunct faculty, as opposed to pay equity. We all know that $10,000 per course is a giant step closer to equal pay for equal work than $5K per course. We also know that $15,000-$25,000 per course would be equal pay at most two- and four-year public and private colleges and universities. However, you don’t get what you deserve, you get what you fight and negotiate for. That’s the lesson Barnard’s UAW faculty union affiliate has taught all of higher education. The Barnard Contingent Faculty Union (BCF)-UAW Local 2110 just showed us all that it’s time for the $25K Manifesto. Raising my salary to 10K per course wouldn’t be a 50% raise. It would be more like 300%. At one campus where I work, it would be 400%. Just as a point of reference: An adjunct instructor at most NC community colleges earns $1300*/3 credit hour class. Full time instructors teach 18 credit hours/semester. And the vast majority of us don’t come close to making $5000/class as full time teachers. This may sound harsh, but for the past three decades FT faculty at colleges and universities around the country have—virtually without exception—taken the bulk of the money budgeted for faculty pay. As an example, at Youngstown State University, where adjuncts have not had a raise in pay in a quarter century, the 2017 budget shows $30,355,273 allocated for FT faculty pay, an increase of $735,119 or 2.5 percent. The FT faculty benefits are budgeted at around $14,000,000. Temporary / Part-Time Faculty, of whom there are 500, were allocated $8,965,711 for pay in 2016 and $8,794,274 in 2017 a decrease of ($171,437) or -1.9%. PT faculty receive no benefits. The truth is that perhaps, in the future, the majority of the college faculty, or better yet those who comprise the majority, that is to say non-tenured faculty, should be paid the majority of a college’s faculty pay budget proportional to the percentage of the instructional hours those adjunct faculty teach. At Youngstown State University, then, adjuncts would be paid $19,000,000 of the $38,000,000 budgeted in 2017 for faculty pay, because they teach half of the college’s instructional hours offered. Full-time faculty would divide the remaining $19,000,000 among themselves. Money for benefits, of course, one could argue, should be allocated similarly. At colleges where non-tenured faculty teach 60-70 percent of the credit hours offered, this might indeed mean that an adjunct faculty member would earn more per course than a full-time faculty member. There’s no reason why adjunct faculty shouldn’t or couldn’t earn more per course than full-time faculty. You don’t get what you deserve. You get what you negotiate. For the past three decades, FT faculty have done their research, taken their sabbaticals, taught their reduced loads, etc…on the backs of academic sherpas. Oh, sorry, I should have been clearer. I am a huge proponent of increased pay for adjuncts. 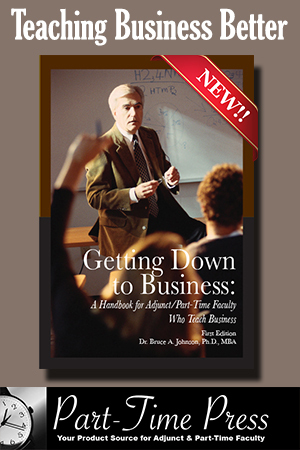 I was an adjunct for many years. I didn’t mean to suggest that full timers should necessarily get significantly more per course. I think there should be a system whereby adjuncts and full timers are paid equally per course. FT could have additional compensation for all of the other obligations associated with a FT position. But you’re 100% correct: it is wrong that 25% of the labor gets such a disproportionate percentage of the salary allocations, as in your example. I really just posted those numbers as a way to point out that in NC, we’re all (PT and FT) grossly underpaid. Why do you say such terrible things about New Faculty Majority? Where are your sources?? The source for the tax returns is the IRS. The 2014 return is linked to in the article. Names and affiliations of NFM board members come from tax returns and NFM website. NFM article links are on the NFM website. It’s hard to dispute federal income tax forms. We wish the tax returns told a different story. Thx for this @AdjunctNation! Our initial ask was $15k. At Barnard $5k has been standard & nowhere near enough. Down w/ this “$5k manifesto”! These are still pathetic amounts to pay someone with the knowledge, ability and qualifications to teach university-level courses. Akin to “working for food.” It is sad that universities are able to so exploit those who have not managed to get tenure track appointments or even full-time university appointments. I’m in a TT line and $10,000 per course is WAY more than I would make if I was paid by course. And, that would be just for teaching, not even all the other “work”. Salaries in Higher Ed are F’ed up. Please come to Connecticut! 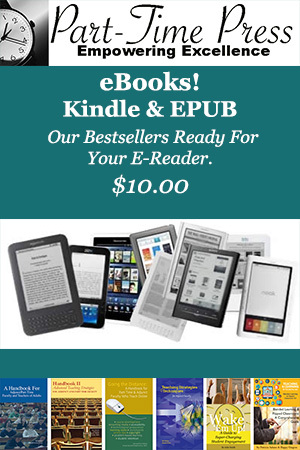 Help us, here, too. Patricia, Barnard’s adjunct faculty helped themselves. No one swooped in and rescued them. They affiliated with the UAW and then worked for two years to bargain aggressively, including voting to strike. They pressured Barnard’s administration to bargain a significantly improved wage. Ah, well. I have only met one or two other adjuncts at Quinnipiac. And my online schools are in other states. I also have been spending the last 10+ years as primary family caregiver to my mother. She recently died from Alzheimers Disease and I now have the time to teach more. But of couurse my CV seems stagnant, I suppose. Patricia, we are so very, very sorry to hear of your mother’s recent death. If you want to get in touch with more of your colleagues at Quinnipiac, we could Tweet something out. Just let us know! As for your CV, check out the JOB-LIST resources at AdjunctNation.com. Lots of great pieces about polishing resumes/CVs and jobhunting. Brilliant! I agree completely and am so excited by the Barnard adjuncts’ win. We shouldn’t forget to give kudos to Barnard admins who finally decided to take that big step. This is history in the making.